The Book Sweet Pea The Bumble bee by Tiffany Bressan Corbett is very inspirational and unique for all ages. Each page has a wonderful positive message, alongside an original photograph with Sweet Pea capturing the true meaning. With wit and humor, the readers mind is charged with creativity and inspired to have a positive outlook on life. 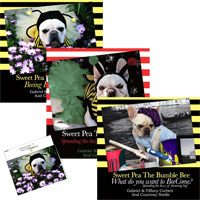 Readers will find Sweet Pea The Bumble Bee, a French Bulldog, very motivating while entertaining them as they turn from page to page to see what Sweet Pea will ‘Bee’ telling them next. If you are looking for an adorable dog book to give as a gift this is one worth getting! WE also have a new holiday Book and the best dream Big book. 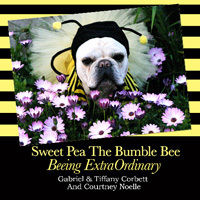 Must become a fan on facebook and twitter of sweet pea the bumble bee. Main entry: Follow my blog on Google Friend Connect (right sidebar) and leave a comment as to what is your favorite type of animal. Leave your email addy with this entry. I love dogs, they don't care what you've done (or not) - they always love you! I'm a follower via GFC and my email is in my profile! Follow on gfc as jhb. Favorite animal is the cat! Favorite jungle animal is elephant and sea animal is the dolphin. Yes I know you didn't ask.